Drone enthusiasts would love to bring their drones to different places, especially if they want to take aerial photos everywhere. Obeying local laws when using drones is important, but drone laws for every country vary, and some places don’t allow them at all. It is tedious to have to figure out drone laws as you go, and frankly, sometimes it could be a hassle especially if you have your drone in tow in a country that won’t allow its use to begin with. To help with the planning, frequent traveler Anil Polat created a world map that, in essence, shows the drone laws for every country. 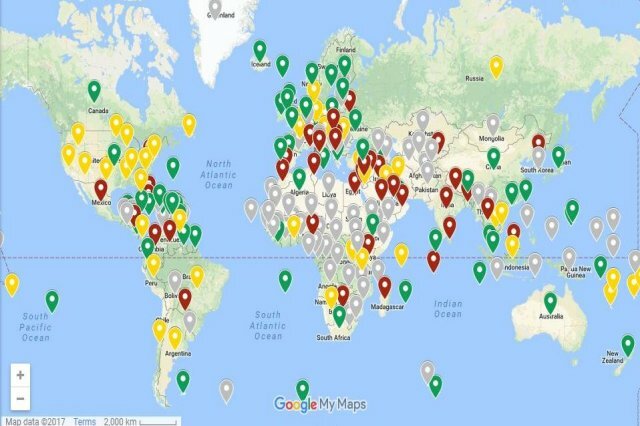 The map uses laws that have been sourced from each country’s governing body and is frequently updated for the benefit of drone users around the world. As it is required that owners register drones with FAA, the map also provides links to registration forms as well as contact information that may be needed in requesting permission to fly in each country. In the United States, drone laws differ from state to state, so Anil also included separate state laws as well as any area-specific laws in other countries when applicable. Anil’s map is hosted by Google My Maps, and the same data is available for the Android and iOS apps. With the help of this smart map, there is no more reason for drone users to be caught unaware regarding drone laws in different countries, and it can plan their trips around respective laws of the next country on their bucket list. Or learn more about our GPS drone tracking devices.